Sand filters can only remove particles down to a certain size. The smallest particles that are not caught by the sand filter can form a mist in the pool water, giving it an unattractive, opaque haze. 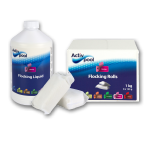 To catch the smallest particles, the flocculant Active Pool Flocking Liquid can be added. It binds the smallest particles into larger units that can be caught by the pool's sand filter. Often, pool water can be unclear because the water's pH count is or has been too high for a period, or this may be due to organic pollution. Test whether the pH count is 7.2 and, if necessary, clean the water with a chlorine shock using, for example, Active Pool Chlorine Quick. Makes unclear pool water clear again by gathering very small floating particles in larger units, whi..